As far as statement making victories go. This will do just fine. Right after the heels of their first ever Test series win, Bangladesh achieved the first ever ODI series win in tremendous fashion when they beat Zimbabwe by 8 wickets in the 5th and deciding ODI match. After the early loss of opener Nafees Iqbal, Mohammad Rafique and Aftab Ahmed launched a massive onslaught on the hapless Zimbabwe bowlers. When Rafique fell for 72(66b 7x4 4x6), the fat lady was clearing her throat. Habibul Bashar then joined Aftab to see through this historic win. Aftab ended his magnificent innings 81* (87b 10x4 2x6). Earlier, Zimbabwe had won the toss and elected to bat. After a good start, the inclusion of three left arm spinners by Bangladesh appeared to have paid off. Manjural Rana, Mohammad Rafique and Enamul Haq jr shared 6 wickets and Zimbabwe tumbled to 198 all out. Barney Rogers' 84 was the only bright spot in their innings. Rajin Saleh (56*) and Khaled Mashud (28*) patiently batted out almost 22 overs to insure a maiden series win for Bangladesh. The match ended in a draw, the first natural draw for Bangladesh in cricket. The hosts had earlier won the first test by 226 runs. For Zimbabwe, the consolation was avoiding a whitewash and a great performance by their 21 year old captain Tatenda Taibu. Taibu was adjudged both Man of the Match and Man of the Series. Tatenda Taibu scored his maiden hundred (153) to give the hosts a challenging target (374). At the end of the day, Nafis Iqbal (55*) and Javed Omar (36*) batted patiently for 57 overs to wipe out 98 runs from the target. The final day equation stands at Bangladesh needing 276 runs and Zimbabwe needing 10 wickets. The days highlight was Taibu's hundred and another five wicket haul for Enamul Jr. Enamul became the youngest bowler to get a 10 wicket haul in test cricket. The hosts continued their slow chase scoring 37 runs in 30 overs in the first session. Javed Omar's painstaking innings came to an end with four overs to lunch. Omar (43 off 258 balls) and partner Nafis Iqbal (77 of 260 balls) scored a BD record opening partnership of 133 runs in 83 overs. To win, Bangladesh requires 239 runs while Zimbabwe will be shooting for the nine wickets to level the series. Bangladesh recorded their maiden test victory with a thumping 226 runs win over Zimbabwe. This was the 35th test for Bangladesh. Zimbabwe lasted only 10 overs after lunch in the face of some inspired bowling by Enamul Haque Jr. and Mashrafee Bin Murtaza. Enamul recorded the best figures for any Bangladeshi bowler with 22.2-5-45-6, which earned him the man of the match award. Masri picked up 2 wickets for 45 runs. Zimbabwe were all out for 154 runs with the last seven wickets falling for 42 runs. There will be a lot of fanfare all around the country and among Bangladeshis living abroad. Our best wishes to the players, the coach and the millions of fans who have stood by the side over the years. In the morning, Brendan Taylor and Hamilton Masakadza started cautiosly but let loose soon after. At one stage the pair scored 60 runs in 9 overs. Enamul broke the partnership and 4 overs later, he removed dangerman Tatendu Taibu for a duck. Masakadza lasted 8 more overs before becoming Enamul's fourth victim of the innings. The hosts will look forward to wrapping up the innings before tea. OD Matches: Bangladesh A won the 5 match series by 3-2. 4-day Matches: The A teams drew 1-1 in the 3 match series. Bangladesh in Zimbabwe, February-March 2004. Test Matches: Zimbabwe won the 2 test series by 1-0. "I feel proud of them. We sometimes pushed them [India] back and there were a lot of positive things to enjoy. I am very much more hopeful for the upcoming Zimbabwe tour." "I'm sure the boys are here to win. 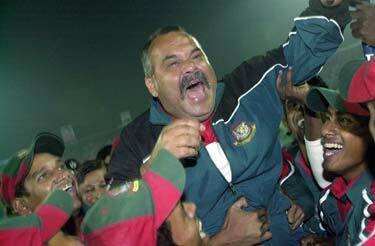 We know that it [Bangladesh] is a changed side but that doesn't change anything"